You are in store if you need all the tips+tricks+hacks to get through hosting! I’m gonna give it to you straight… Thanksgiving is 3 weeks away, and you’ve still got plenty of time to prepare and pull this off if you are hosting! It’s actually my fav holiday of all. It’s like time slows down and everyone can enjoy each others company. But we all know, the holidays can be a mixed bag: incredibly joyous—spending time with friends and family, eating delicious food, taking a bit of well-deserved time off—but it can also be stressful. I’m going to be hosting some of our family members, and I made this plan last year and it was phenomenal, literally no fail. 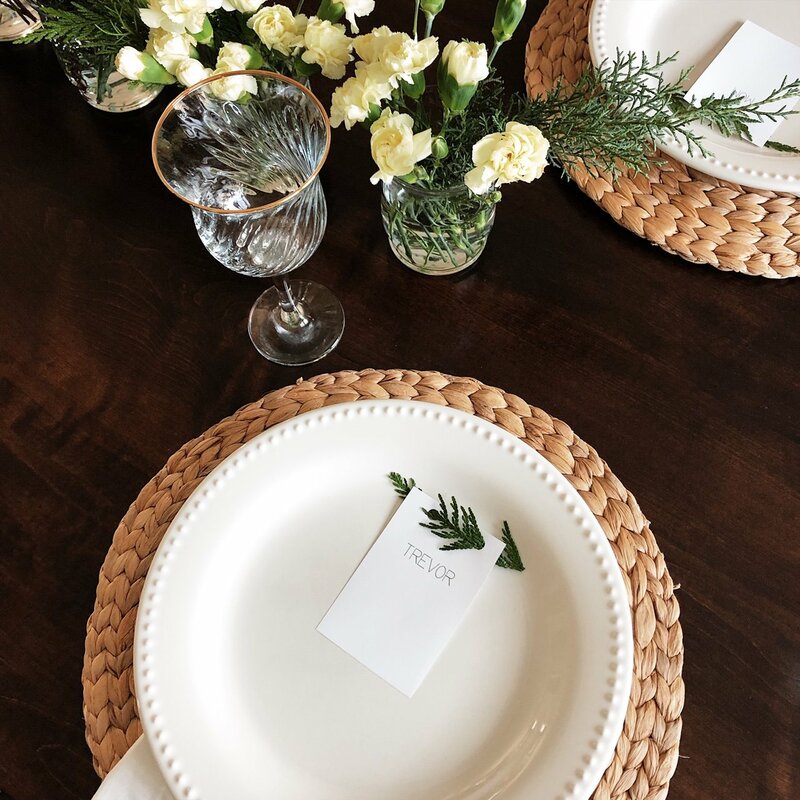 First things first…I’m planning to feel like a guest at my own party again this year, and here is how you can too. Now. You can’t really plan a party without a master list! Click here for a pretty printable to start on your list! No excuses! We get a lot of our food each week from our favorite local market, Community Farmers Market. They are open year round here in Bowling Green, every Tuesday and Saturday. Local is ALWAYS better than the grocery, I promise! Plus, you can get to know the farmers and their practices! Use that list you made and go ahead and start buying some of the items off it. This will also spread the cost out some too! Yay for saving dolla bills. Pull out your serving pieces, platters, and bowls and make sure you have enough for everything on your list. This is one of the easiest things to get out of the way ahead of time. Make sure these are cleared out Wednesday night, because you don’t want to be cleaning them out when you are in the middle of something else on Thursday. As much as possible before Thursday. Get yourself ready first. This is the perfect time to use the coveted Beautycounter flawless in five set. For real, effortless beauty in five minutes, yes please! Hubs is in charge of everything outside of the kitchen and basically when I need him. Go ahead and tell whoever you will be delegating to, that way they can prepare themselves! This also might mean you ask a friend or family member to bring something off your menu, no shame! You don’t have to do it all! Because champagne makes everything better! Follow the plan so you aren’t a crazy person on Thursday! Lastly, remember it’s not about the food, it’s about quality time with your family+friends+loved ones…and giving thanks for the wonderful things+people you’ve been blessed with. Enjoy yourself and go with the flow! Here is a run-down of my menu+plan. I’ve linked all the recipes that I will be using again this year! Almond butter cookies, a fav adapted from one of my sweet friends, Meredith. Quite possibly the easiest recipe on earth too, 1c almond butter, 3/4c coconut sugar, 1 egg. 350 degrees for 20-25min. Just watch them. Disclaimer: I made everything on this menu last year, using the linked recipes. They have been tested and are Sarah approved, otherwise they wouldn’t have made it on this list! That covers everything. What is one of your favorite fall recipes?! Maybe I will add it into my menu!